Lodovico Caracciolo (1761-1842) was a Roman painter and engraver who specialised in panoramic views and architectural drawings of his native city. The term 'panorama' describes several forms of large-scale pictorial entertainment that enjoyed widespread popularity in the 19th century. 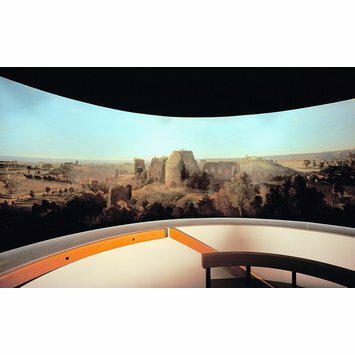 The term was devised for a 360° view painted on the inside of a large cylinder and viewed from a platform at its centre, an exhibition technique invented in 1787 by Robert Barker (1739-1806), an Irish artist working in Edinburgh. This enabled the paintings to be displayed under carefully controlled conditions to foster an illusion of reality, drawing upon traditions of illusionistic decorative painting, topographical prospects and contemporary theatrical sets. The popularity of Barker's circular paintings inspired imitators around the world. By the 1880s the panorama had spread throughout Europe and North America and became big business, financed by joint-stock companies and standardized in size to facilitate production and touring. By the end of the century however the panorama had largely run its course. In the V&A canvas, Caracciolo depicts the Eternal City appears from a high viewpoint looking down, as if viewed from the top of the Palatine hill. The foreground is filled with lush vegetation, fields and shepherds with their flocks, which give way to views of some of Rome's most famous monuments and ruins, from the Campidoglio to the Tarpean Rock. The bright blue sky transforms into a yellow-pink sunset and enhances the illusionism. In 1831, Caracciolo made an aquatint panorama of the city of Rome after this painting, joining six prints to create the final view. Historical significance: Lodovico Caracciolo (1761-1842) was a Roman painter and engraver who specialised in panoramic views and architectural drawings of his native city. In the V&A canvas, the Eternal City appears from a high viewpoint looking down, as if viewed from the top of the Palatine hill. The foreground is filled with lush vegetation, fields and shepherds with their flocks, which give way to views of some of Rome's most famous monuments and ruins, from the Campidoglio to the Tarpean Rock. The bright blue sky transforms into a yellow-pink sunset and enhances the illusionism. In 1831, Caracciolo made an aquatint panorama of the city of Rome after this painting, joining six engraved prints to create the final view. The term 'panorama' describes several forms of large-scale pictorial entertainment that enjoyed widespread popularity in the 19th century. 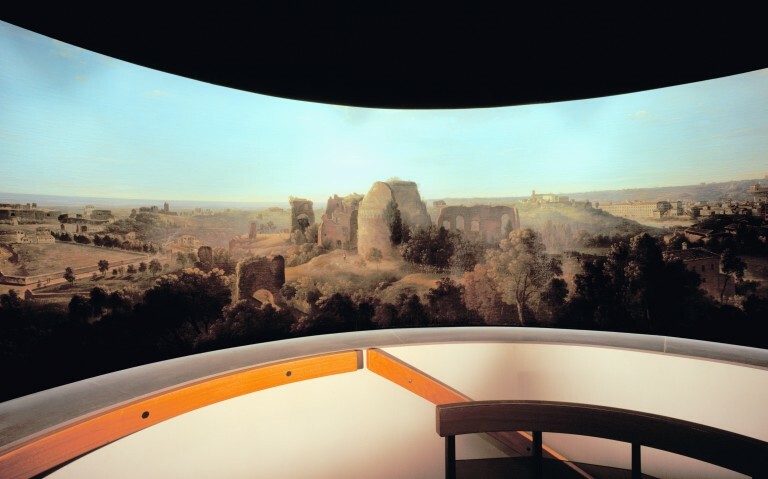 The term was devised for a 360° view painted on the inside of a large cylinder and viewed from a platform at its centre, an exhibition technique invented in 1787 by Robert Barker (1739-1806), an Irish artist working in Edinburgh. This enabled the paintings to be displayed under carefully controlled conditions to foster an illusion of reality, drawing upon traditions of illusionistic decorative painting, topographical prospects and contemporary theatrical sets. The popularity of Barker's circular paintings inspired imitators around the world. By the 1880s the panorama had spread throughout Europe and North America and became big business, financed by joint-stock companies and standardized in size to facilitate production and touring. By the end of the century however the panorama had largely run its course. Kauffmann, C.M., Catalogue of Foreign Paintings, II. 1800-1900, London: Victoria and Albert Museum, 1973, pp. 17-18, , cat. no. 46. Roma, la magnifica visione : vedute panoramiche del XVIII e XIX secolo dalle collezioni del Museo di Roma. Cura della mostra e del catalogo: Patrizia Masini ; Anna Aletta ; Fabio Betti, Roma : Gangemi, 2008.